The art of editing wedding videos begins and ends with storytelling. The post-production side of wedding videos - the editing, is where the art of cinematic wedding videos begin. If you are a professional videographer or photographer or just need your wedding video edited or a new video created, you've come to the right place. At Outsource2india we use cinematic-quality imagery to create stunning wedding videos that you can't stop looking at. We provide 360-degree wedding video editing services through professional, certified editors, digital artists, and designers. We employ some of the latest and best video editing tools and technologies which ensure that we deliver the best results within a quick time. If you are a busy wedding videographer and don't have time to cut through the footage, let us do it for you. Send us your best footage and get back the finished video in a high definition, professional video. You can ask your guests to send you their video clips, or provide us with your own footage. We will create an engaging and emotional wedding video, irrespective of the quality of the raw clips. Unhappy with the way your wedding video looks? We can re-edit it according to your specifications. If you want all the key moments of your wedding in a 3-minute wedding video, we will browse through your footage, cut it, slice it, and select the absolute best moments (or use the ones you specifically want). If you do not have any footage of your wedding day, we can use any photos you have to create a slideshow/video montage. We add the right musical backgrounds, animations, and effects to create a breathtaking story. We combine visual elements from separate sources into single images. This is done to create an illusion that all the elements are parts of the same scene. Certified editors create timelines for each section of the day, import the relevant footage, crossfade audio, delete undesirable shots, and carefully sync and edit together multi-camera sections. A continuous flow of motivated edits, avoiding jump-cuts, and mismatched shots, is the goal of our wedding video editors. These effects are added to soften the images and provide serenity, vignettes, and weddings are a match made in heaven. Lighting effects like lens flares, spotlights, and flashes are added to mimic lighting conditions not present in the original wedding footage. Slow motion replay of special, emotional moments or the time-condensed replay of otherwise lengthy events and large groups are examples of the effective use of time remapping. Outsource2india has been a leading provider of 360 degree wedding video editing services in India and a host of other video editing services. 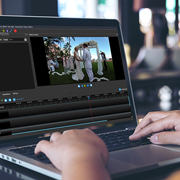 Our team comprises of some of the most skilled and talented video editors who are capable of delivering the best quality wedding video editing services in a quick time. All our processes and services are ISO certified and follow international standard guidelines. To get started and have your wedding footage edited by professional editors at the best costs, get in touch with us today!